A rice cooker lets you make rice without constantly monitoring or stirring a pot. The Betty Crocker rice cooker works with all types of rice, including wild and long-grain varieties. It is designed to cook rice evenly so that all of it is cooked and none of it is burned, so it automatically shuts off when the rice is done but continues to keep the rice warm. Spray the inside of the Betty Crocker rice cooker with cooking spray. Add water and rice. 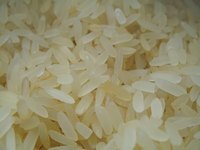 Pour in one cup of water for every cup of rice you use. Put the lid on top of the rice cooker. Turn on the rice cooker. The Betty Crocker cooker will turn off automatically when it's done cooking and change to warming mode. Let the rice sit for 10 minutes after it is done cooking. You can keep the rice in the Betty Crocker cooker for as long as you need to after it is finished; it will stay warm even hours later.